PCRA Saksham National Competitions 2018 Poster, Brochure, Salient Features: PCRA National Level Essay Writing, Painting and Quiz Competitions for School Children 2018. Previous year, Schools/ institutions were enrolled for PCRA National Level Competitions during 2017. Petroleum Conservation Research Association (PCRA), under the aegis of MoP&NG, GOI conducting competitions-2018 on a National Level for School Children in India. As part of its mandate, the Essay Writing, Painting and Quiz competitions aim to raise awareness among youth about practical conservation tips for the conservation of Petroleum Products in Industrial, Transport, agriculture and domestic sector, and how to practice such tips in their daily life. PCRA request for your conducting National Level Competitions-2018 for school children-minimum 200 Nos to participate in the PCRA competitions. The competitions are conducting from 01st July, 2018 to 30th September, 2018. We are enclosing the detailed brochure which is self-explanatory along with Salient Features as Annexure. There are more than RS 2.5 Crs worth Prizes including Trip to Singapore. PCRA seek your as usual co-operation and support for a National Cause and to spread the message on conservation of petroleum products. 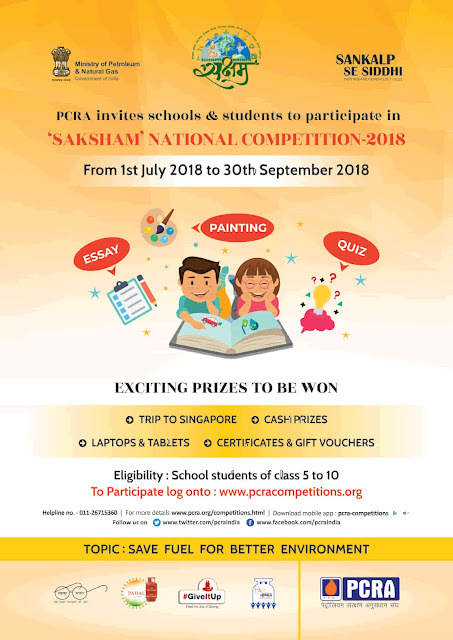 School Education, Telangana, Hyderabad "National Level Painting, Essay Writing & Quiz Competitions for school children to promote awareness on ‘Conservation of Petroleum Products’ with a Trip to Singapore, Laptop & Cash Prizes to be won"